John and Sally Ouellette on their farm, where wood from the property was used to build Madison Children's Museum exhibits. When John and Sally Ouellette took a financial advisor’s suggestion and created the Ouellette Family Donor Advised Fund, they never imagined the joy it would bring them. Now nearly two decades later, the endowment has allowed them to give away more than their original investment. Not only that, the fund today is worth more. John would know. 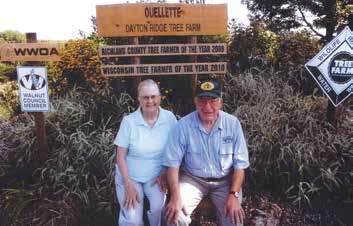 Back in 1971 the Ouellettes purchased the 297-acre Dayton Ridge Tree Farm in the Driftless Region near Richland Center. It’s there that they’ve tended to a lot more than black walnut and other fine hardwood trees, sharing their farm with service and learning communities that come from far and wide to learn and grow from their experiences. Over the years, they’ve hosted Girl Scout troops, church groups, UW-Madison soil scientists, forestry students, and field days for the forest industry—even Badger football players who, according to Sally, had never been on a farm. And John says they’ve planted trees for the next generation of family and visitors to enjoy as well. The spirit of generosity is a theme woven throughout the Ouellette’s lives in both rural Wisconsin and back home in Madison, where they raised their four children and now happily dote on their grandchildren near and far. As devout Catholics, much of their charitable giving is focused on religion. They generously support the Catholic Diocese of Madison’s seminary education programs, as well as Blessed Sacrament Parish, their place of worship, which also receives Christmas trees from Dayton Ridge. The Ouellette’s children and grandchildren inspire their giving choices, too. John’s smile grows wide and he lets out a hearty laugh as he remembers his grandkids’ fearless climbs to the top of the Mad City Waterski Team pyramid. Sally proudly shares the newspaper clipping of her grandson Rock scoring two home runs at a recent West High School baseball game. From water sports to soccer clubs to baseball teams to college athletics, the Ouellette’s donate to charities and programs that not only enrich their family’s lives, they make sure to support friends and teammates who otherwise couldn’t afford to buy uniforms or travel to tournaments. In 2010, the Ouellettes made a very special gift that left a lasting legacy for all of Madison to enjoy. The mixture of hardwoods for the floors, cabinetry and woodwork that brings happiness to every child that plays in the Madison Children’s Museum came right off Dayton Ridge Farm. “He’s always liked to take care of living things,” says Sally of her husband’s decisions in life, career and philanthropy. For Sally, making people happy makes her happy, plain and simple.